Music Aloud If music be the food for life, we serve mini meals! It seems to be a really bad month for Indian music. Less than a week after D K Pattammal left us, Hindustani virtuoso Gangubai Hangal breathed her last earlier today at Hubli. Born in Dharwad in 1913, Gangubai got trained under the tutelage of the renowned Sawai Gandharva in the Kirana Gharana, the same gharana that produced such greats as Bhimsen Joshi and Pt. Channulal Mishra. She was also one of the very few ladies to come out of the illustrious gharana. She made her musical debut at the 1924 Belgaum session of the Indian National Congress. A strict purist, she always believed in the classical tradition of music. In one of the rarest instances of recording for a movie, she sang a song in the Marathi movie Vijachi Lagan. Gangubai was awarded with the Padma Bhushan, Padma Vibhushan and the Sangeet Natak Akademi Award at different stages of her life, for her outstanding contribution to the world of Hindustani music. Her autobiograpy titled Nanna Badukina Haadu (The Song of my life) was released three years back. 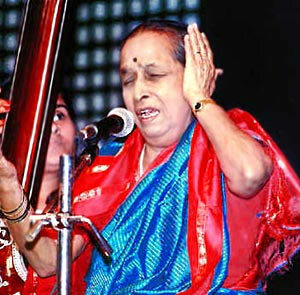 With Gangubai’s demise ends a great era in Hindustani music. Below is a video of her performance.